Now offering Identity Protection - Alarmex, Inc. Through our home security systems powered by Alarm.com, Alarmex is pleased to now offer an Identity Protection service plan through a partnership with PrivacyMax, a respected identify protection and privacy management company. Identify theft is a growing and serious issue and this new service allows our customers to have peace-of-mind, knowing their they will receive pro-active alerts of potential issues, as well as around the clock assistance and full identity restoration should a theft incident occur. All of this protection is handled by the highly trained, identity restoration professionals at PrivacyMaxx. Alarmex customers who enroll in this service are able to enroll not only themselves, but other family members as well. 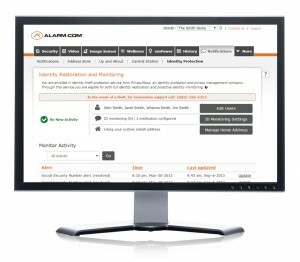 The activation process is easily done from one’s computer after logging into their Alarmex security system. Call Alarmex today at 978-887-2999 for more information or to take advantage of this unique offering for an extremely affordable price.